All Silver pieces are wrapped in Sterling Silver with 16" Sterling Silver Chains, or in 14 karat Gold filled wire with 16" Gold filled Chains. All pieces are one-of-a-kind and measurements are approximate. 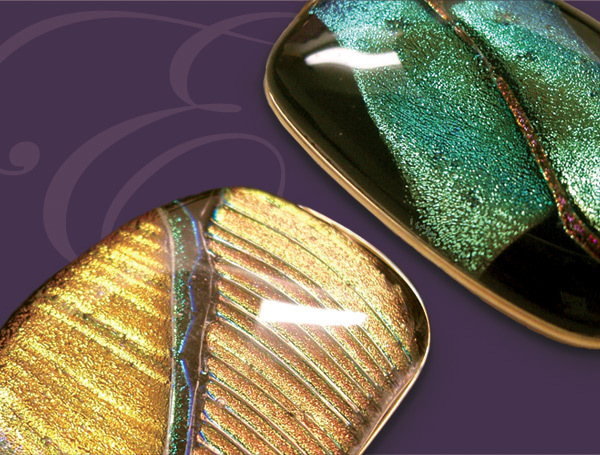 ***ABOUT DICHROIC GLASS*** The depth and color and dimensional pattern in these pendants is the result of a special technique that fuses glass and micro-thin sheets of metal oxides under the high heat of a kiln, a process that dates back to the 4th century AD. All pendants are available in Sterling Silver ($45.00) or filled Gold ($55.00) with 16" chains (other size chains available) and come in a velveteen pouch and a black gift box with gold cord. Actual piece may vary slightly from piece shown, since they are all one of a kind. 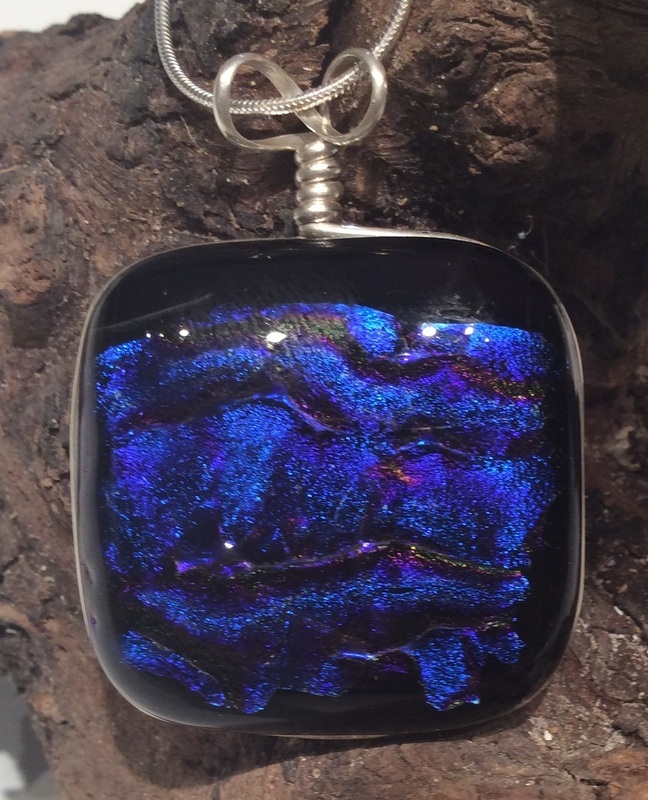 P2 Blue Dichroic Glass Pendant exhibits the truly unique nature of Dichroic Glass. 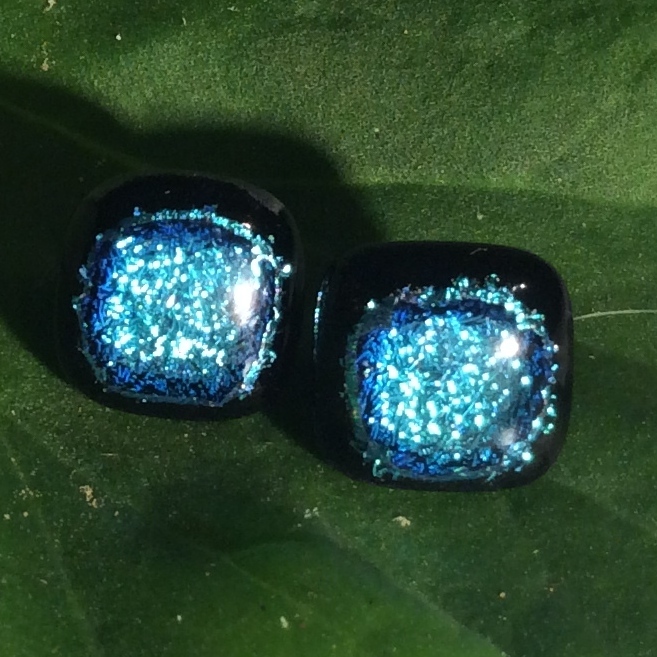 Color: Iridescent Blue on dark background. 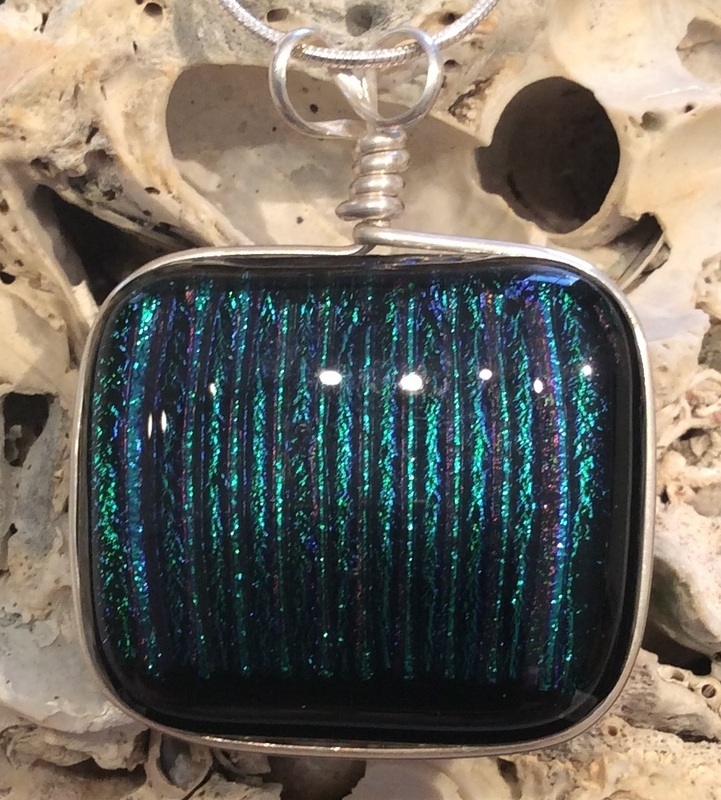 P3 "Tiger" Dichroic Pendant. This is hands down one of my most popular designs. This version, on a clear background, makes the overall effect light and airy when backed by light colors. When backed on dark colors, the piece become vibrant with colors. Color: Orange and Gold on clear background. P4 "Rain" Dichroic Glass Pendant displays subtle color variations when viewed from different directions. Color: Translucent blue with silver/blue stripes on clear background. 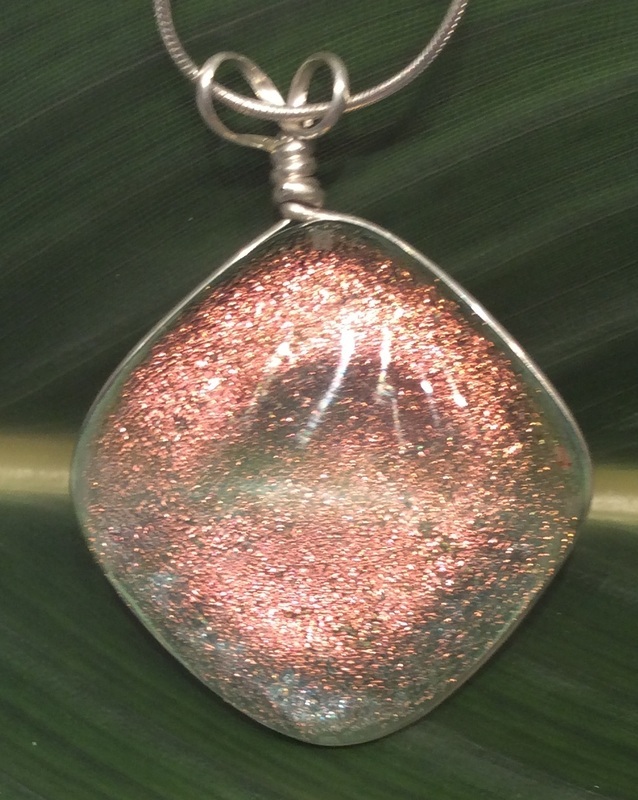 P5 Diamond shaped Coral Dichroic Glass Pendant on clear background. Color: Iridescent Coral on clear background. 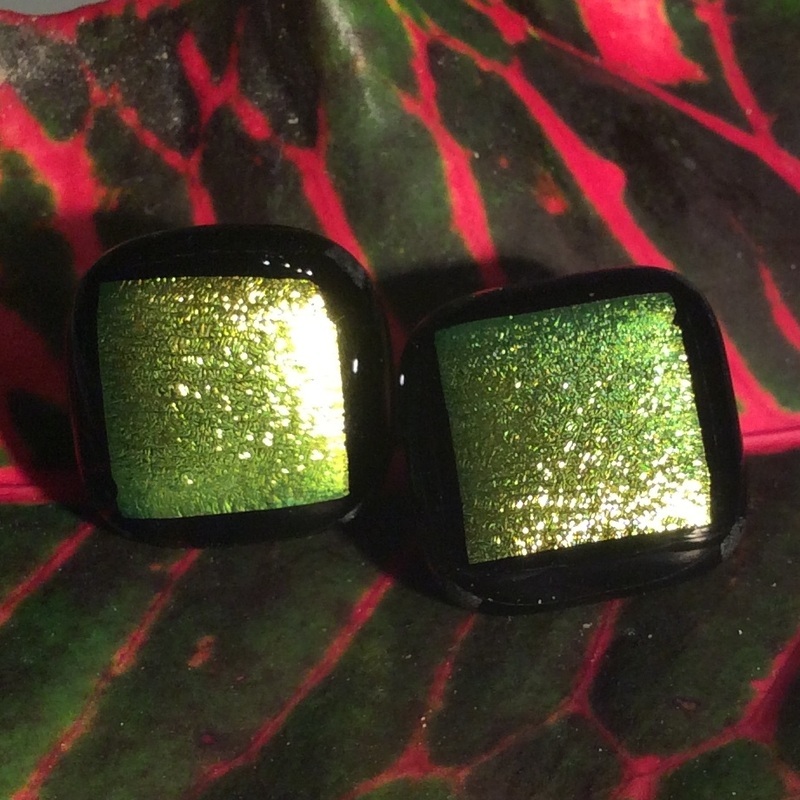 P6 Diamond shaped Green Dichroic Glass Pendant. Color: Iridescent Green on dark background. 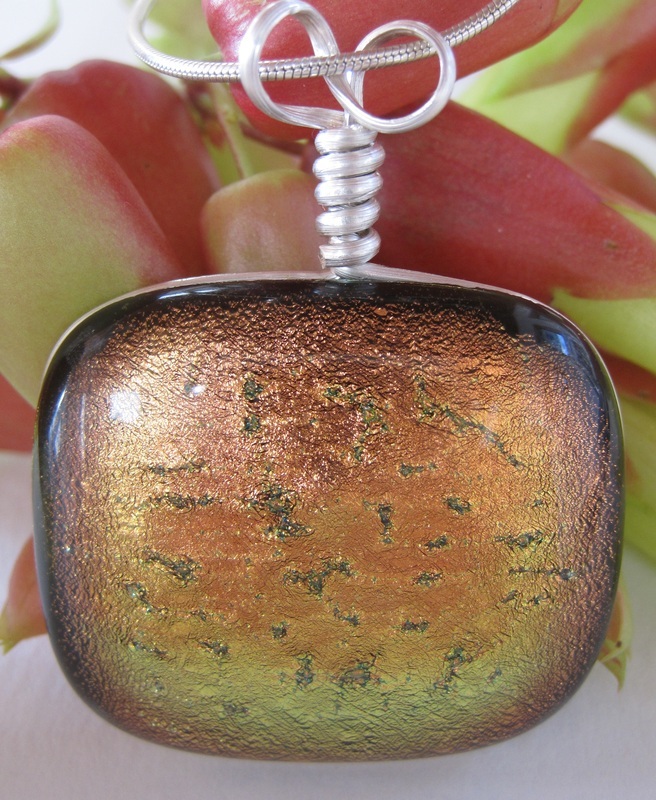 P10 "Flame" Dichroic Glass Pendant. Color: Iridescent red/orange on a dark background. 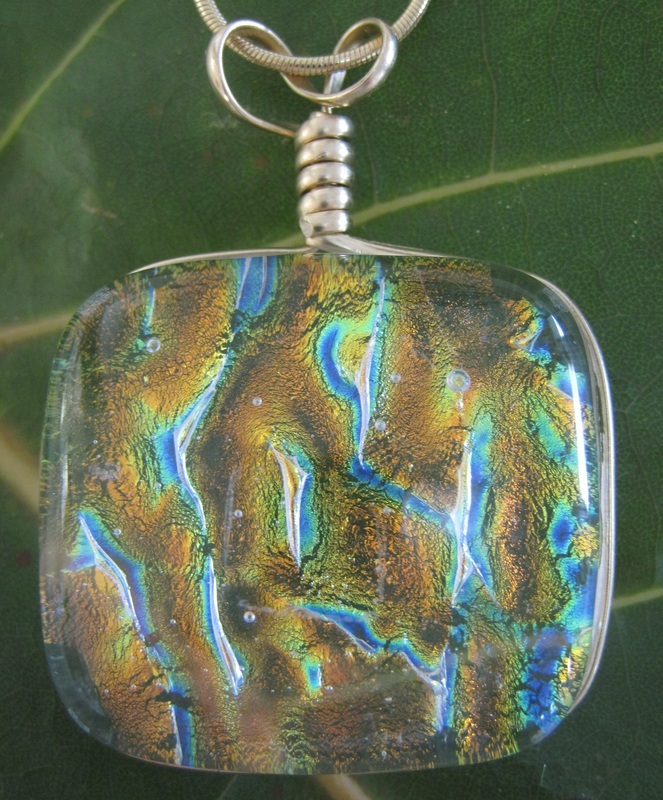 P14 "Blue Waves" Dichroic Glass Pendant has an interesting organic pattern. 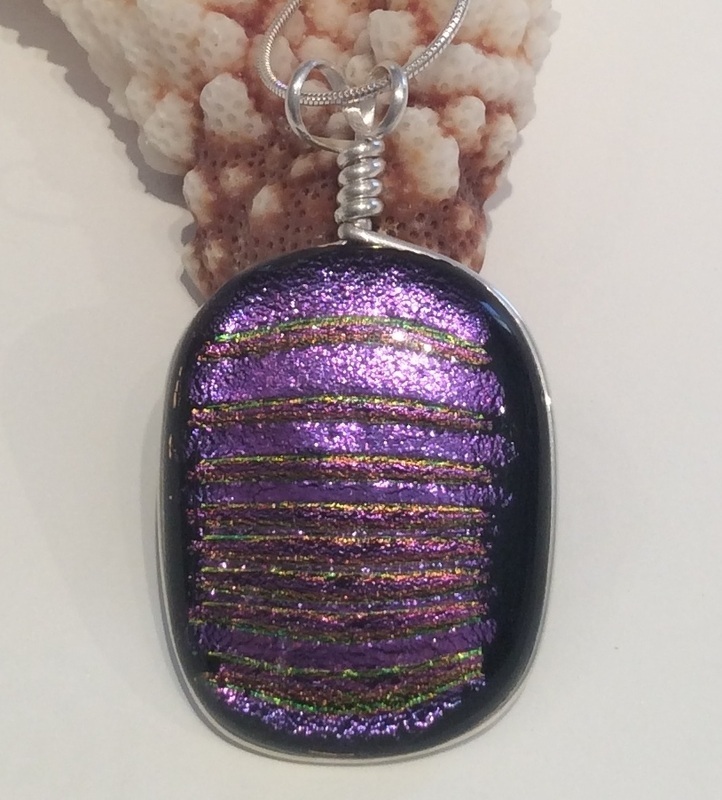 P18 "Fuchsia" Dichroic Glass Pendant with subtle lines. Color: Fuchsia on dark background. 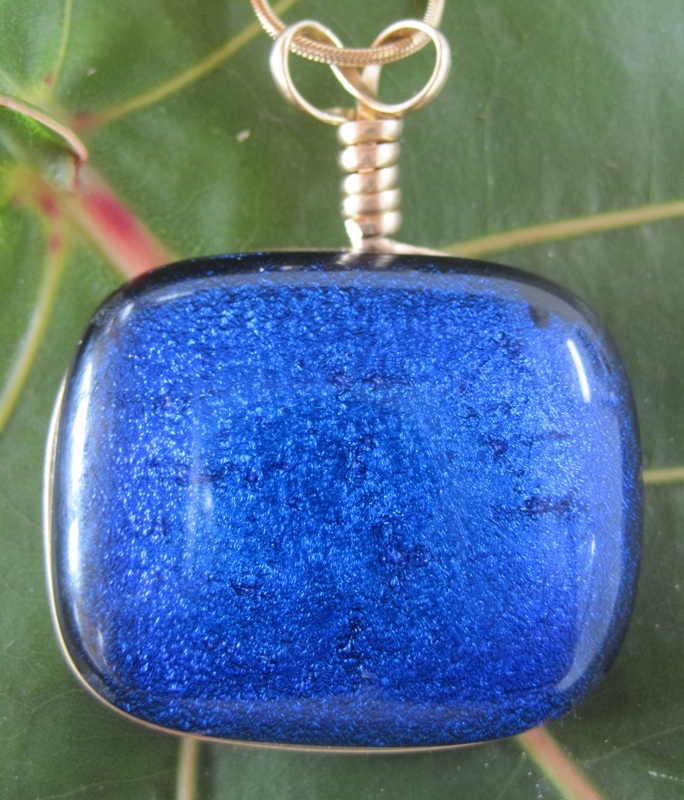 P7 Several shades of deep Blue Dichroic Glass Pendant. 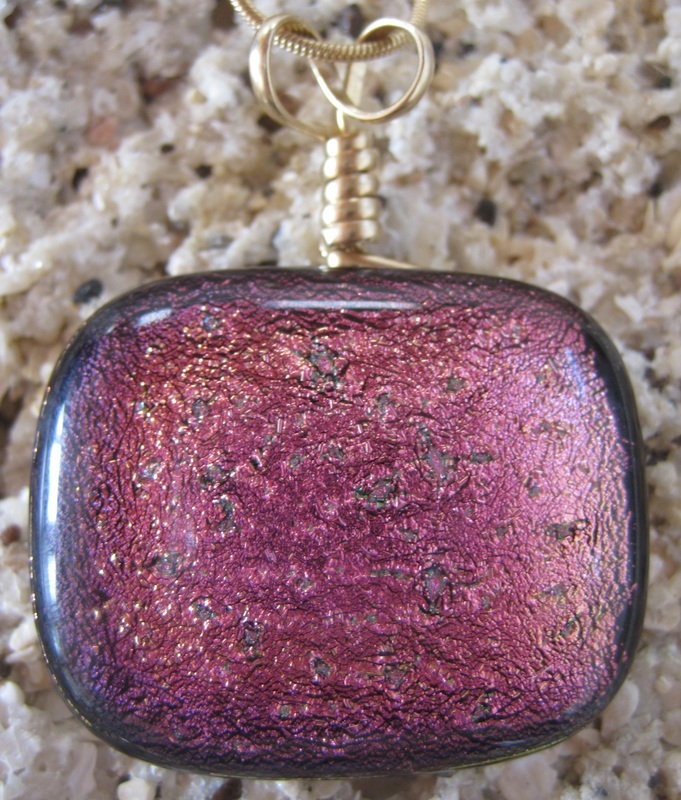 P11 "Fuchsia" Dichroic Glass Pendant. 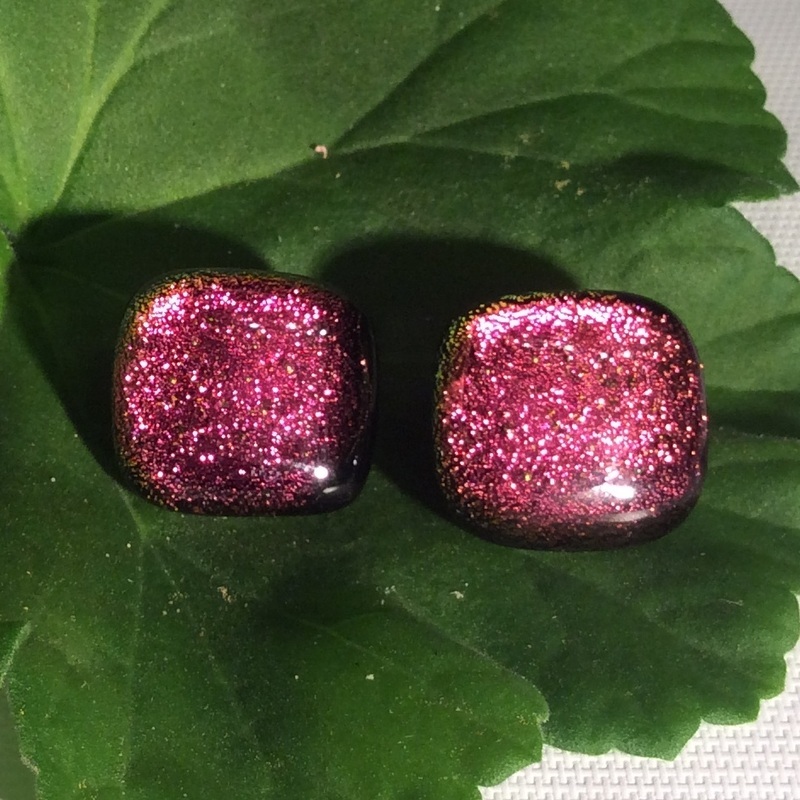 Color: Iridescent fuchsia on dark background. 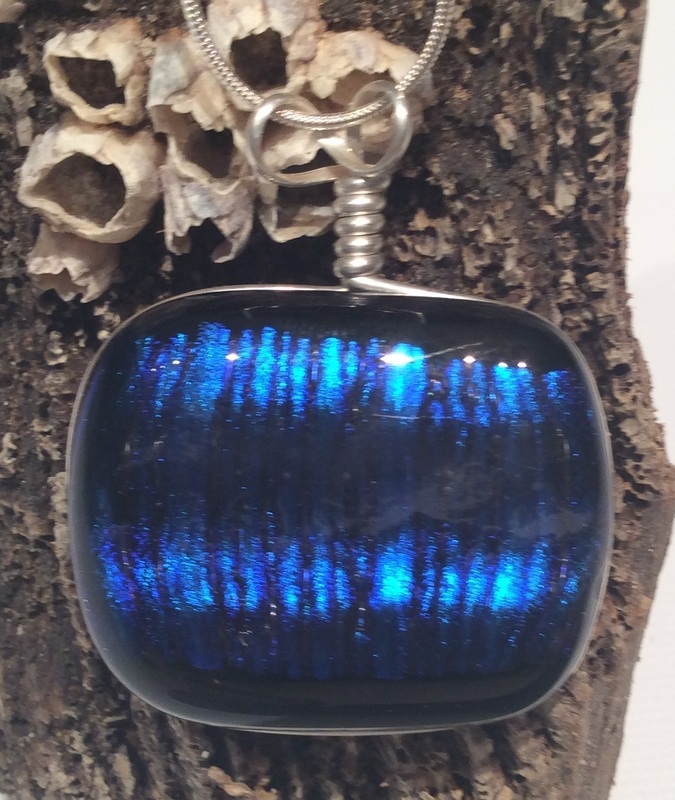 Size: 1 1/$' x 1"
P15 Shimmering blue Dichroic Glass Pendant. One of my most popular pieces, light and airy. 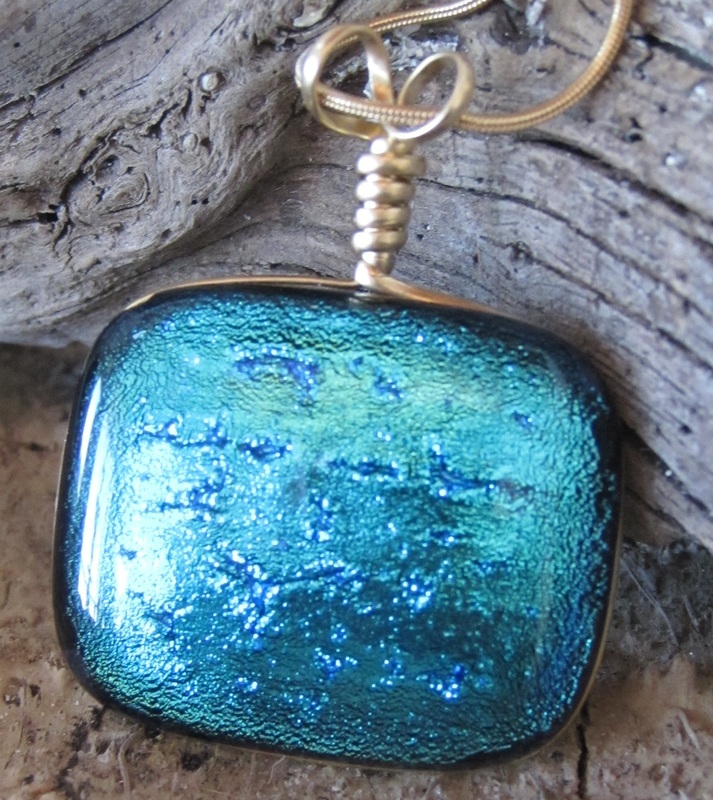 P19 Shimmering Blue Dichroic Glass Pendant. Color: Blue on black background. 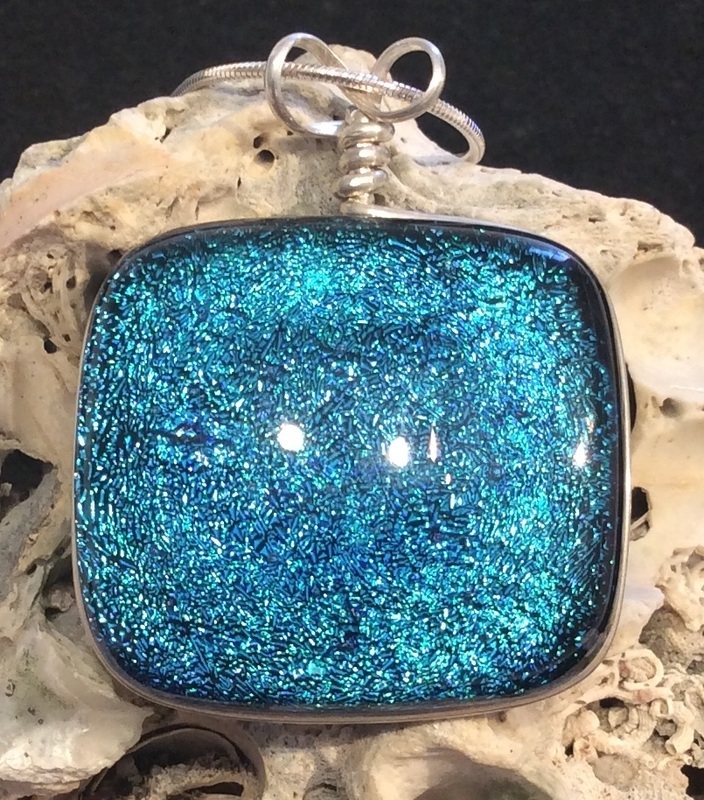 P8 Blue Dichroic Glass Pendant. Color: golden and shades of green, blue and yellow on a clear background. 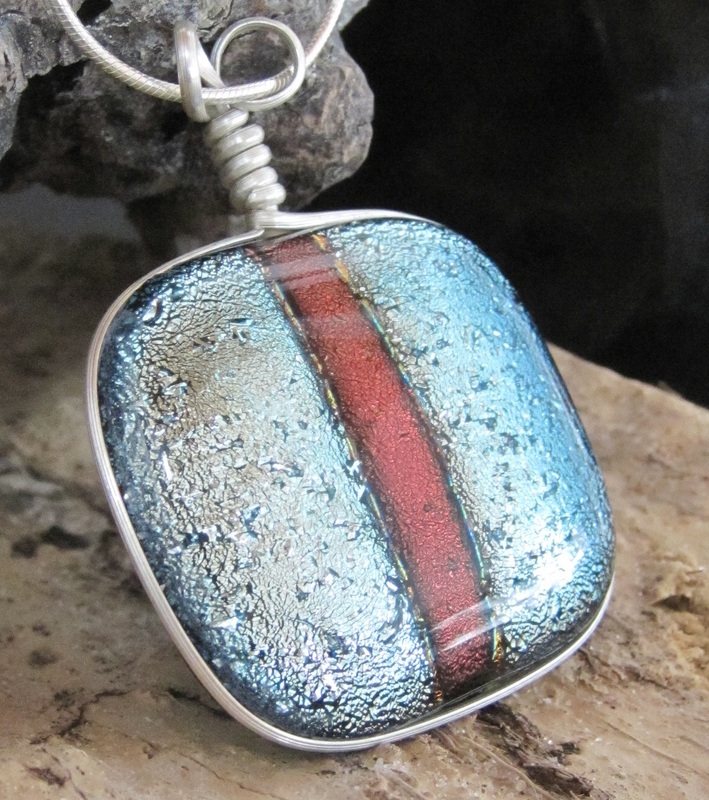 P16 "Silver Stripe" Dichroic Glass Pendant. This piece can turn even the simplest outfit into a sophisticated statement. 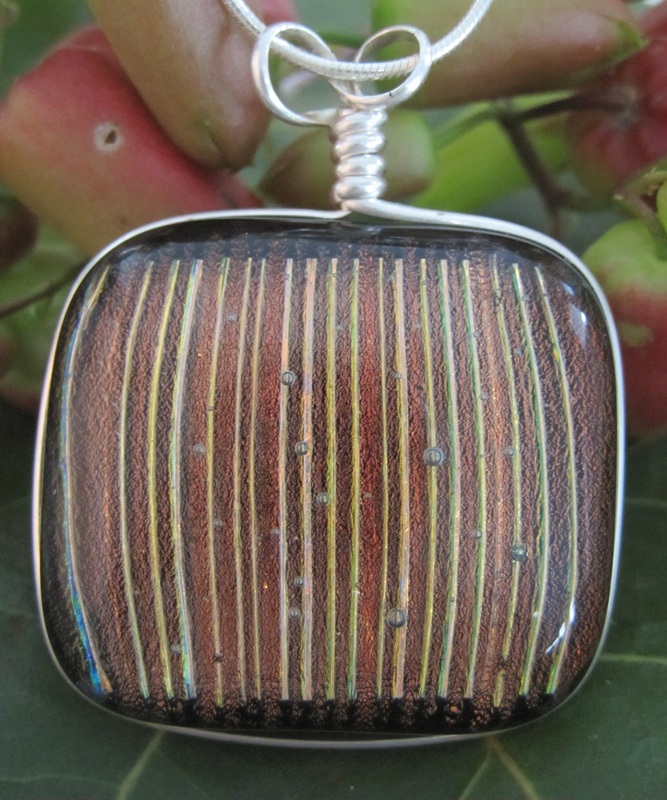 Color: Iridescent silver with copper/brown stripe on dark background. 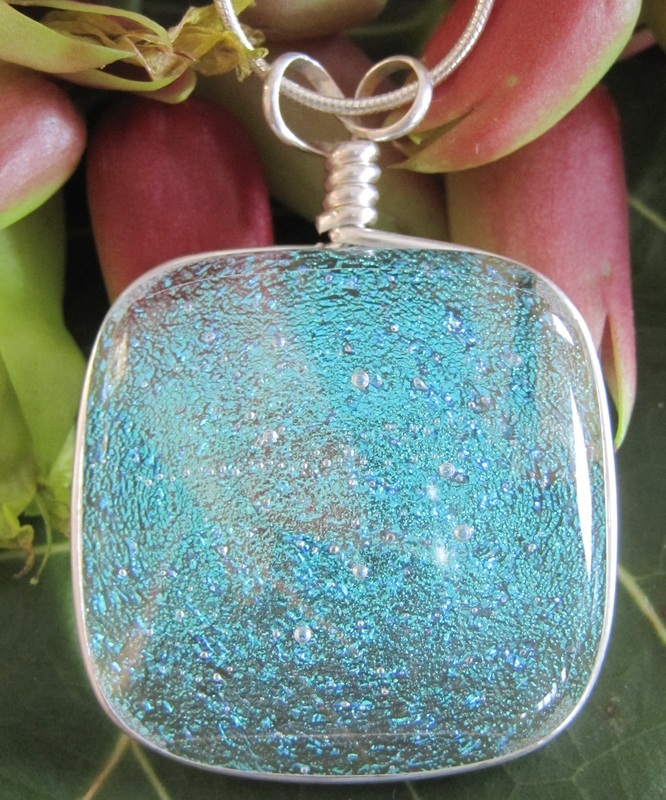 P20 "Rain" Dichroic Glass Pendant. Color: Vertical stripes in shades of green on a dark background. 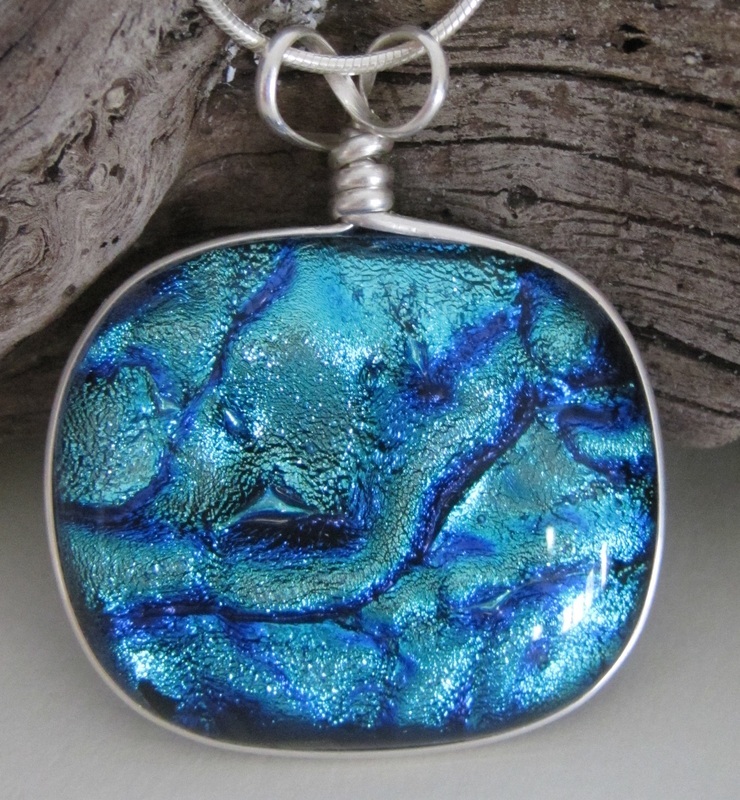 P9 Cobalt "Waves" Dichroic Glass Pendant. Color: Cobalt Blue on dark background. P13 "Tiger" Dichroic Glass Pendant. The metallic Tiger stripes are on a dark background. Thin and elegant. Color: Iridescent orange/gold on a dark background. 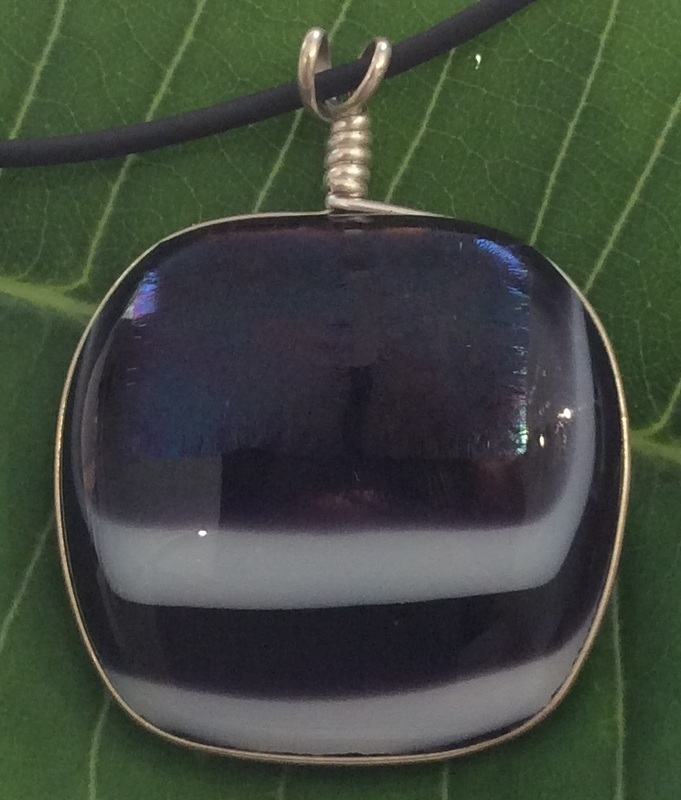 P17 "Zebra" Glass Pendant with silver trimmed black rubber cord. Only available in silver. 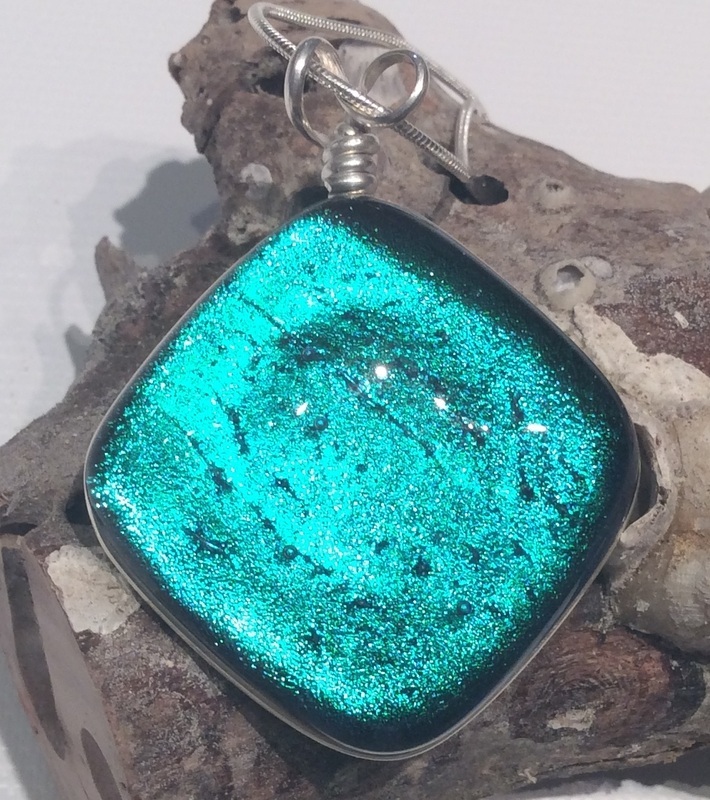 P21"Fuchsia and Shades of Green" Dichroic Glass Pendant. Color: Fuchsia and shades of green. 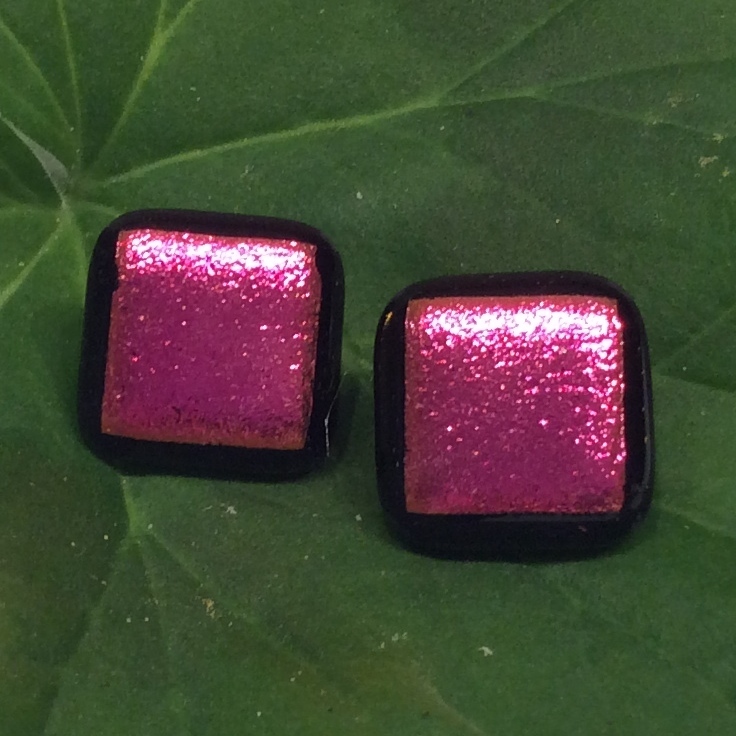 Size: 1 1/4" x 1 3/8"
All Earrings are available with "clips" or "posts"